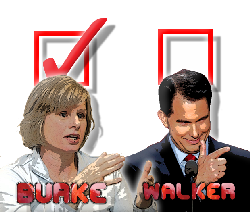 Scott Walker, the Koch brothers darling, governor of Wisconsin is now tied in a neck and neck race for re-election with Mary Burke, an educated, business professional with state governmental experience. Should be a "no-brainer" for Burke, but unfortunately that is what happened last time when the state elected this dirt bag, teabagger and certainly did not use their brains. See the Progressive here or TPM here.